• US President Donald Trump was lambasted on social media after releasing a White House handout purportedly showing him working during the government shutdown. • Online commenters pointed out Trump's stiff posture and empty desk. • Trump's desk has been busier in the past, but his workspace lacks the family photos that previous presidents often showcased. Your desk can shine a light on some of your work habits and personality traits. So it's not surprising that a recent photo of US President Donald Trump spawned a number of reactions on social media. The White House handout depicts Trump sitting at the Oval Office's Resolute desk. The surface of the desk is mostly clear, aside from a phone. 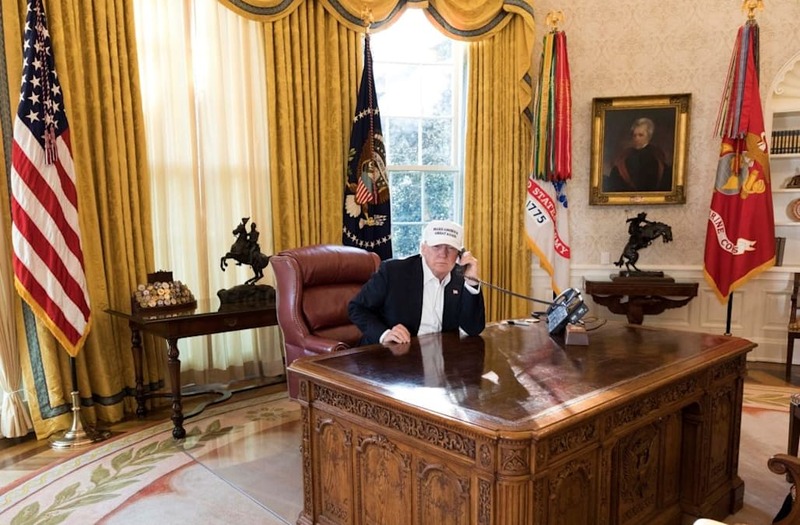 Trump appears to be leaning forward in his chair listening to a phone call, while wearing a white "Make America Great Again" hat. Some Twitter users speculated whether or not the POTUS was getting much done at all, pointing out his stiff posture and empty desk. "Home Rule: Households, Manhood, and National Expansion on the Eighteenth-Century Kentucky Frontier" author and Western Carolina University history professor Honor Sachs even took to Twitter to compare Trump's workspace with that of previous presidents. Her tweet thread spanned Barack Obama's tidy work zone to Teddy Roosevelt's paper-strewn desk. Business Insider also found some photos of past president's desks. Of course, these photos aren't necessarily definitive portrayals of their typical workspaces. It's relatively easy to move objects around and clear things away when it comes time to sign a bill or pose for a photo op. But it's clear that Trump's White House workplace set up lacks one element adopted by many past presidents: prominently featured family photographs. In fairness, Trump's desk hasn't always appeared so clutter-free. Getty's Drew Angerer captured stacks of files during the president's contentious phone call in August with Australia's prime minister, Malcolm Turnbull. But the president's desk is now barer than it was in his former spot in Trump Tower. That desk was piled high with papers and flanked by a row of trophies, photos, and bobblehead dolls on the windowsill. In Barack Obama's White House, pictures of the president's family were prominently featured behind his desk. George W. Bush also displayed family photos, along with a bouquet of flowers, in 2004. Bill Clinton's desk boasted a jumble of photos, busts, and picture frames in 2000. George H.W. Bush's workspace looked a bit neater, as he kept his personal photos on a table behind his desk in 1989. This strategy also worked for Ronald Reagan in 1981. Even though this photo was taken as Gerald Ford prepared to vacate the White House, his desk still featured several stacks of papers, as well as a cup and saucer. In this 1973 photo, Richard Nixon talks with Henry Kissinger over tea or coffee at his desk. On the table behind him is a bust of Abraham Lincoln, along with family photos. When it came to John F. Kennedy's workspace in 1962, one desk phone wasn't enough. In this similar shot, Kennedy's predecessor, Dwight D. Eisenhower, works on a desk featuring a phone, ink, and lots of documents. Harry S. Truman's desk also featured the familiar heaps of paper, with a table of mementos and family photos in the background. Microphones from various news outlets lined Franklin D. Roosevelt's desk as he prepared to make an announcement.